Lunch and dinner in Great Harbour. Lobster, seafood, pub fare. World famous New Year’s Eve parties. TVs. Gift shop. 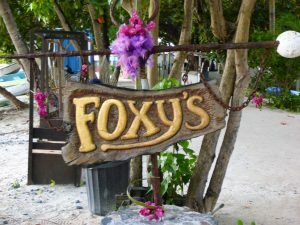 Foxy’s is the place if you want to dance and drink and have a good time. The food is fine and the service is okay, but the large beach bar is truly made for the nightlife and creating commotion.